A chance to combine the best of the famous W Trek trail with sea kayaking past icebergs, rock-climbing beside a glacial lagoon, and ice-hiking over the enormous Glaciar Grey. A 10-day adventure challenge that is far from typical, you'll also rest up before and after in a very comfortable hotel. By the afternoon: Rock climbing at Laguna Sofia (35 Km. from Puerto Natales) this is a sport climbing area with more than 15 routes (from 20 to 40 meters) level difficulty goes from 5 to 7b+. The rock is conglomerate, and the highlight of this place is that you can see many condors around the cliff. Climbing gear included: Rope, helmet, climbing shoes, harness and safety equipment. Public Transportation to Torres del Paine (75 miles). After arrival at Las Torres Hotel, our first trekking goes up to the lookout of the Towers, about 2.300 feet of elevation, one of the highlights of the park: the base of the towers themselves. Seen from up close, next to a beautiful green lagoon with a vertical rock face towering more than 3.000 feet directly upward, it is, in two words, awe inspiring. We continue our trek up to Japanese Campsite, climber base camp. Day walk by a moraine of granite into the Silence Valley. It is a privileged place with a great view of the west faces of the Torres Del Paine. 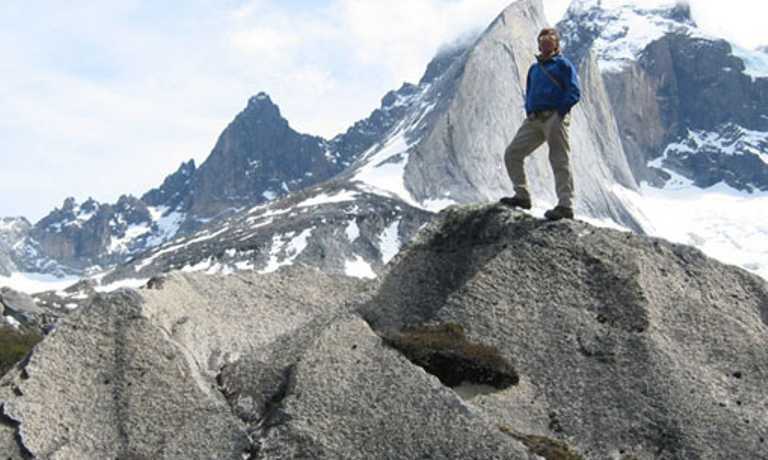 The Shield and Fortress are the bigger granite walls in Paine that have captured the attention of mountaineers for decades. Clear the camp and trekking to El Chileno Refuge through the Asencio Valley. Trekking to the Campamento Bader along a trail known as the âCuernos Passâ which links the Hotel Las Torres with the Campamento Italiano. The last section of the trail passes along the slopes of the Cerro Almirante Nieto. There is no official trail as this valley is only used by expeditions that are going to climb the walls of this mountain. This campsite is located in a small patch of lenga beech trees and it has a small cabin which was built by the climbers themselves whilst they waited for good weather. It is considered to be the gateway to the Bader Valley. Leaving the woods we find the north-western wall of the East Cuerno and perfect fissures can be seen on the granite. The ascent of the valley crosses an expansive glacial moraine of granite rocks which have formed small valleys and lagoons. The wind too has produced a very remarkable splendour to this place. On this trek it is possible to see the Hoja (Leaf), Mascara (Mask) and Espada (Sword) hills, all of them made of granite walls between 700 to 900 Mts. high. From Bader is another perspective of the Torres, the big wall of the South Tower and the hanging Glacier on its base. The walk goes to reach Campamento Italiano, close to the French Glacier, which is famous for its constantly falling ice and small avalanches. These names refer to where famous climbing expeditions set up base camp when they came to climb the various granite faces in this Valley. Trekking from Campamento Italiano to Lodge Paine Grande, an easy, fairly level trail along Lago Skottsberg with great views of Los Cuernos del Pane. Last section of the day goes to Lodge Lago Grey surrounding Grey Lake and its floating icebergs carried by the wind to its shore. This Trek offering great views of the Olguin Range and the mountains Punta Bariloche, Ferrier and Donoso. By the morning professional guides will lead guests on an exploration through the impressive ice formations on the most important tongue of the Southern Patagonian Ice Fields in Torres del Paine National Park, the Grey glacier. Equipped with crampons, harnesses, ice axes and cords, participants will get to walk on one of the planetâs largest ice. At 13:00 hrs. weâll do the check in at Grey Refuge for Grey Glacier boat trip. This is a beautiful way to say goodbye to Paine, visiting the front of the Glacier by water. 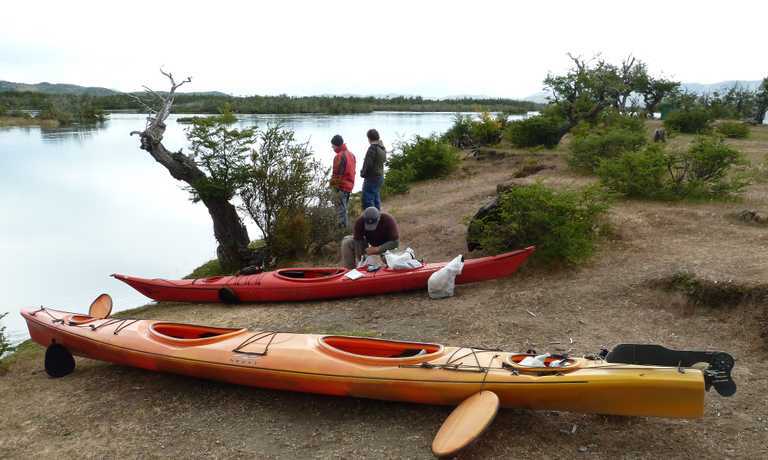 (2 hrs) The navigation ends at Lago Grey Hotel, where you will have a private transfer to the shores of the Serrano River. We will load the kayaks and make last preparations for the day. Our guide will give us a brief explanation of safety and instructions for paddling efficiently. Weâll start paddling Serrano River till Serrano waterfall (1.5 hrs). Here, we will carry the Kayaks for about 60 mt. to avoid it. WeÂ´ll keep paddling through the Serrano River, in our journey to Serrano Glacier. Weâll paddle with amazing views of Tyndall Glacier and Geike Range. Weâll keep going, surrounded by beautiful Lenga and Cypress forests that live in the river shores, getting closer to the Mount Balmaceda, till we join the waters of Ultima Esperanza Fjord, in these same waters in which Juan Ladrilleros intensely sought an outlet to the Atlantic (1558), from this point we will discover the beautiful view of the Serrano Glacier. After breakfast, we will carry the Kayaks for about 40 mt. to the Serrano Lagoon (where the Serrano Glacier ends). 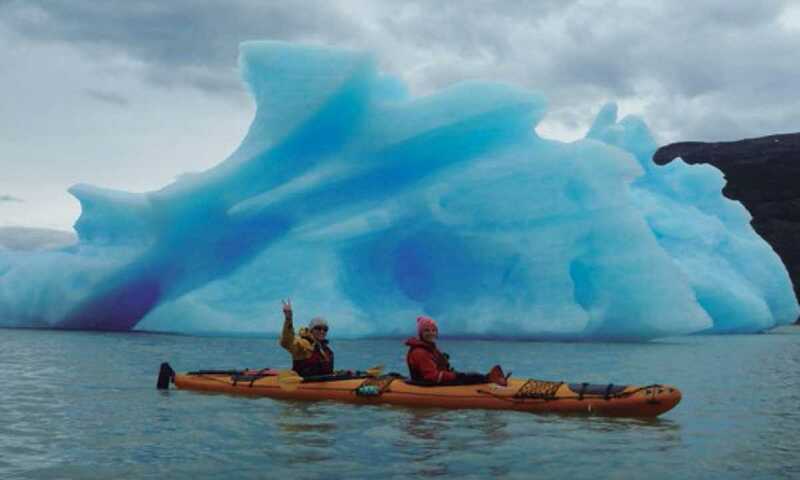 Here weâll paddle between the blue Icebergs that brake from the front of the enormous Glacier. At noon weâll take a boat back to Puerto Natales, through the Ultima Esperanza Fjord. At around 14:30 weÂ´ll make a stop at Perales Ranch, for a traditional Patagonian Lamb Barbecue. We'll arrive to Puerto Natales at 18:00 hrs. This trip can run as a group trip, with prices starting from $3,795 per person for a complete group. If you are looking to join a group or you are a solo traveller we will help to form likeminded groups of travellers. Please let us know your travel plans.